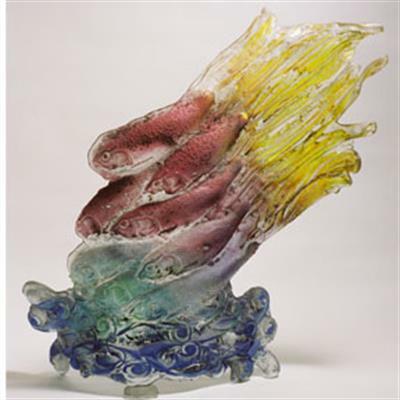 AMANDA INCREDIBLE GLASS SCULPTURES HAVE CAUGHT THE ATTENTION OF MANY OF THE WORLD’S LEADING GALLERIES AND COLLECTORS AND MUSEUM COLLECTIONS. WORKING WITH THE MATERIAL AT ITS VERY LIMITS, THE SHEER SCALE OF AMANDA’S SCULPTURES IS DRAMATIC AND TRULY INSPIRING. THERE IS AN ENORMOUS COMMITMENT MADE BY THE ARTIST WHEN UNDERTAKING SUCH PROJECTS AND AMANDA EMBRACES AND REVELS IN THESE OPPORTUNITIES TO CREATE SUCH MONUMENTAL, ABSTRACT PIECES. THERE IS A STRENGTH AND GRANDEUR IN HER SCULPTURES THAT IS WHOLLY ORIGINAL AND CAPTIVAT.